Sizzling Paleo Steak Night? Yum! When my daughter had the idea of photographing an evening meal prep session for the blog, it seemed like fun. 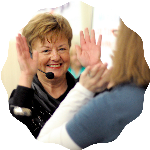 (How do we keep our energy high while leading the Wake Up Workshop? By having pre-cooked treats stashed away in our hotel room!) 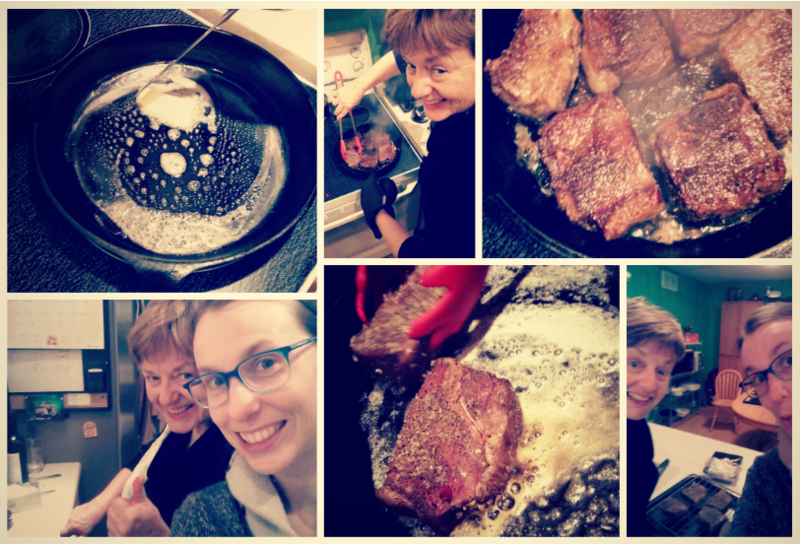 She had sent me a guide from one of our favourite paleo cooking blogs, Nom Nom Paleo on “How to Make the Perfect Steak.” This is actually a fairly quick meal. 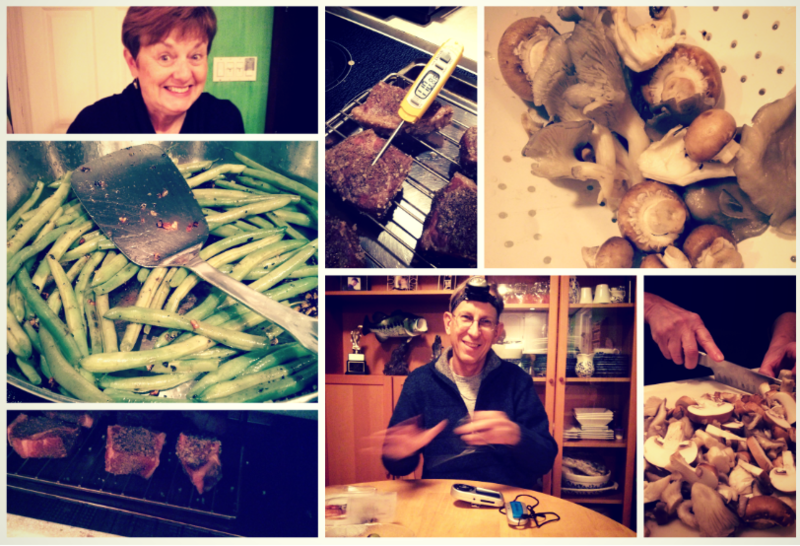 The most intensive part of the meal was figuring out how the meat thermometer worked. But once Tony figured that out, we were on our way. 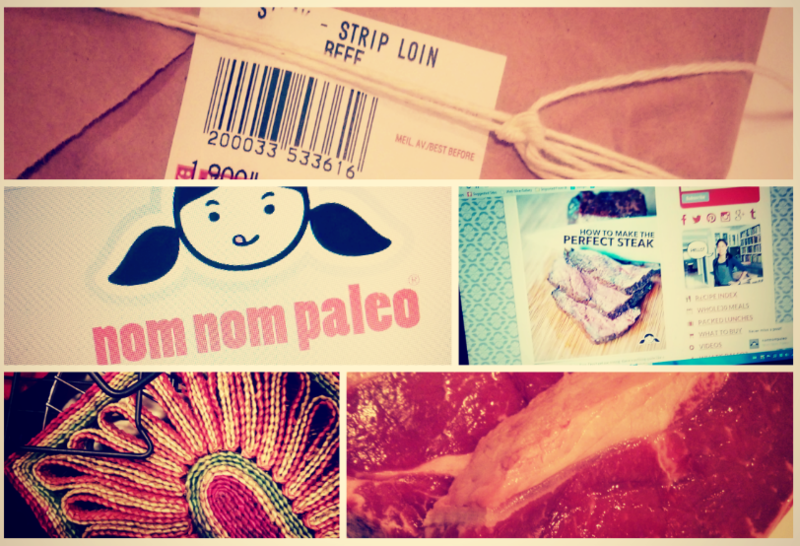 Making the ‘perfect steak’ according to Nom Nom Paleo. Here we go! First, we bought the meat from one of our favourite butchers in Ottawa, Aubrey’s Your Corner Butcher. We’ve been driving downtown about once a month or so to pick up their meat. But here’s some good news, they deliver on orders over $50. Now that we know that, Tony can be saved the headache of downtown parking! While Nom Nom suggests cutting off the excess fat, we cut off some but left most of on. “More flavour!” we agreed. What came next was the prepping of the meat. 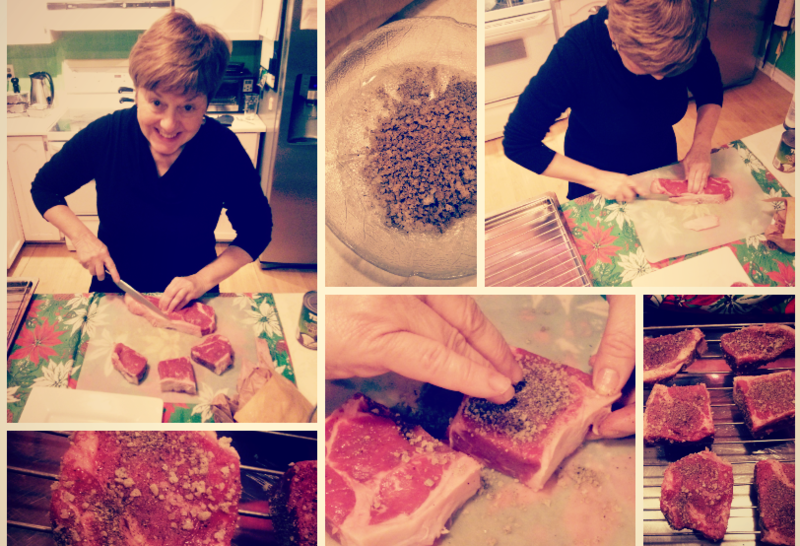 We sliced the steaks into six portions, and then sprinkled them over with the salt and pepper mixture. This is one of those instances where having beautiful salt makes for beautiful food. It’s well worth spending that bit extra for the quality. Next we had the challenge of the meat thermometer, which we never use and have no clue how to work. But when things become technical, I pass them over to Tony. He’s the household fix-all-guru. So, he dove into that challenge. My daughter, Catherine, mostly snapped photographs with her phone the entire time. But she did also manage to make some beans. That’s a very simple recipe – clean and prep your green beans. Then in a wok or a pan, warm the oil and throw in ginger and garlic. When it’s smelling fantastic (and not burnt), you throw in the beans. They cook in the pan till they are a little seared. Then, to finish it off, you add a dash of Raw Coconut Aminos, which is a really tasty substitute for Soya Sauce. We find it at the Rainbow Food Store. The meat quickly reached its optimal temperature for being medium cooked. It felt almost too quick, but we trusted the thermometer and took it out. What followed was a hot skillet, butter, and a lot of excitement! Once pan-fried to help the steaks become crispy and beautiful, we left them to rest for about ten minutes. Then, voila! 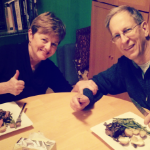 A delicious steak dinner with leftovers for the Workshop. Now, I’ll admit that we’re not steak experts. But one way or another, they food was excellent. The salt and the juiciness was very nicely done. So, we’ll be well fed at the Wake Up Workshop this coming weekend. What about you? Are you prepping food? Or have you found any amazing paleo recipes online lately? Link your ideas and photos up here. I love reading about good food. See you next Friday. You guys are going to be Awesome! The Ultimate Wake Up is on this week. We can still squeeze in a few spots, so click here to learn how to sign up. This year’s workshop will be taking place November 14th to 16th at the Southway Hotel on 2431 Bank Street. Tickets to the three day workshop can be ordered via Eventbrite – and once you’ve joined on, you can visit us on our facebook page to say hello and connect with other participants. See you on Friday!